This is a common and widespread species which usually matures in spring/early summer, before most other harvestmen. It was first recorded in Britain by Meade (1855), from different parts of England. It is apparently absent from Orkney and Shetland and much of western and southern Scotland. There may be some under-recording because of its early maturity. It is widespread in Europe, north to Finland and east to western Russia but absent from Iberia. It has been introduced to North America (Bragg & Holmberg 1975). Platybunus triangularis is usually found in the field and ground layers of woodland and grassland. The adults may be beaten from scrub and the lower branches of trees. Adults are present from April through to September, with a peak in May/June. Eggs are laid in early summer with hatching extending through to the autumn. Juveniles are found from August, overwintering until they reach maturity in spring/early summer. Philipson (1959) recorded juveniles in all months of the year. Platybunus triangularis is found up to 460m in Britain and to 2200m in the southern Alps (Martens 1978). Invertebrate food items recorded include Diptera, woodlice and a dead wasp! It is not believed to eat either plant or fungal material. There is considerable ecological overlap between P. triangularis and the larger, recent invader P. pinetorum and their interactions would be worthy of study. Bragg, P. D. & Holmberg, R. G. 1975. Platybunus triangularis and Paroligolophus agrestis: two phalangids introduced to North America. Journal of Arachnology 2: 127. Meade R. H. 1855. XXXV. 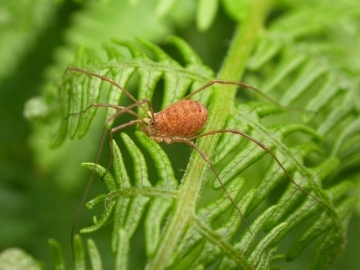 Monograph on the British species of Phalangiidae or Harvestmen. Annals & Magazine of Natural History 2nd Series 15: 393-416. Philipson, J. 1959. The seasonal occurrence, life histories and fecundity of harvest spiders (Phalangida). Entomologists’ Monthly Magazine 95: 134-138.